If you don't want to pay Garmin for their expensive connector for the GPS38/40/45/90 then check out the first sharehardware project for a low cost connector from the Purple Open Project. This page is not about hacking the map formats but is about an older issue with 8 channel GPS units and doesn't effect any Garmin GPS reciever made in the last half decade. The GPS45 has a 90.0022kt (104mph) speed limit. It was our intent to find a way arround this. These programs were thrown together to test different parts of the protocol. They were put here for thouse that might want to write their own program but don't know where to get started. They will need some real work to make them stable. Garmin Protocol DOS source code. (Compiled.) Code needs MSC and GPS45 must be on COM2. My GPS VBX (Source Ziped 50K)Code in MSC. I never got around to fixing this and it is rather bad code. If you want to use it feel free but it will require some work. 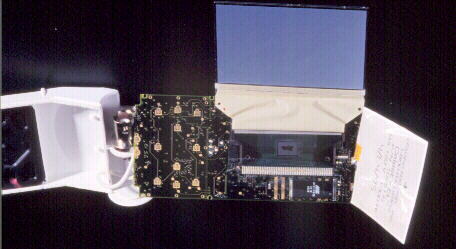 Backside of the display (28K) The ROM is the chip on the bottom right side. Its left side is next to the three verticel bands. The area to the left is where the keypad makes contact. The LCD is the blue rectangle on the top and the backlight is white and on the right. I also have a 5+M JPG image of the circut board. I'm working on a way to get it to people. It's too big for this server. GPS40 in UUENCODED BMP format or GPS40 in UUENCODED GIF format.